The interlocking “NY” logo of the New York Yankees, the Old English “D” of the Detroit Tigers, and the scripted “Dodgers” of Los Angeles are immediately recognizable design elements of the baseball uniform. They not only identify the club, but help define a marketable look. Above all, they “scream” baseball. While some clubs have changed lettering styles over the years, and some continue to alter designs in their search for the perfect look, each team is trying to present a unique and immediately recognizable design. 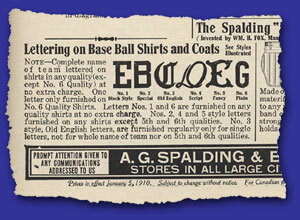 In the early days of baseball, most clubs wore uniforms with either no lettering or only a single letter. If a single character was displayed on a uniform, it was generally the first letter of the team’s host city or town, but team nicknames were also represented. Lettering styles varied from club to club, but a single letter in an Old English font was particularly popular during baseball’s amateur era. 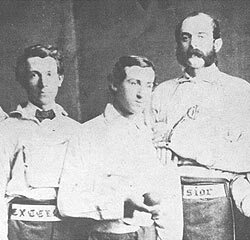 The earliest known team to display a club nickname on their uniform was the 1860 Excelsiors of Brooklyn. Surprisingly, however, the nickname was not found on the cap or jersey, but on the team belt. The word “EXCELSIOR” in an Old English font was embossed on the belt so that the club’s name was proudly displayed across the front of the player’s waist. Other clubs in the 1860s followed this style, but by the mid-1870s the fad had passed. In 1890, the United States Board on Geographic Names dictated that the final “h” should be removed from the names of all cities that end with “burgh.” Accordingly, “Pittsburgh” became “Pittsburg.” The ruling was not rigorously followed by city officials or baseball clubs. For example, the city’s National League club in 1895 wore “PITTSBURGH” on the front of their jersey, while the 1894 jersey dropped the “h.” In 1911, following citizen protests, the “h” was officially restored to the city name. The first major league club of the 20th century to spell out their team nickname on their uniform was the 1905 Washington Nationals (later known as the Senators). The club wore the nickname “NATIONALS” across the front of their jersey for two seasons, after which the club did not display a nickname until 1959, when their jerseys proudly displayed “Senators” in script lettering with a flourish below. Though the new nickname was officially adopted prior to the 1957 season, both “Nationals” and “Senators” were interchangeably used throughout the club’s history. It may be hard to imagine, but throughout the 19th century, many baseball clubs wore uniforms that bore no lettering or graphic imagery whatsoever. This was especially the case for home uniforms, as clubs could assume that fans knew which team was their own. By the turn of the century, however, blank uniforms were a rarity, and in the modern day world of baseball marketing, it’s a sure thing that featureless uniforms are gone for good. The last club to don a blank uniform was the 1905 Chicago Cubs. That season the Cubs wore white jerseys, white pants, dark blue stockings and dark blue caps. With rare exception, lettering on baseball uniforms is a horizontal or slightly angled affair. However, starting in 1909 and lasting for half-a-dozen years, a number of clubs dabbled with vertical displays of text on their buttoned placket. In 1909, “CHICAGO” was displayed on the placket of the Cubs’ road jersey. In 1910 and 1911, the Chicago White Sox featured the abbreviated team nickname “SOX” on their home jersey placket. The word “BROOKLYN” was found on the placket of the club’s 1911 road jersey. 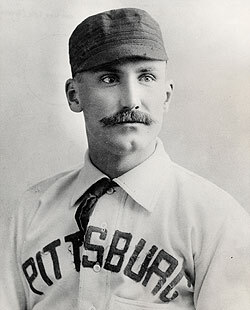 In 1912, Pittsburgh’s home and road uniforms featured “PIRATES” on the placket of jersey. After a one-year hiatus, “BROOKLYN” was once again featured on the placket of the club’s 1913 road jersey. The 1914 Indianapolis Hoosiers of the Federal League donned jerseys with the word “FEDERALS” on the placket. Hall of Fame manager John McGraw was not shy. Following the club’s decisive victory in the 1905 World Series, he unashamedly dressed his 1906 New York Giants in uniforms emblazoned with the words “WORLD’S CHAMPIONS” across the chest. As audacious as it sounds, the Giants were not the only big league club to express such braggadocio. In 1921, the Cleveland Indians donned jerseys with the words “WORLDS CHAMPIONS” on the front, and in 1927 the St. Louis Cardinals displayed the words “WORLD CHAMPIONS” on their jersey front. Each of these three clubs failed to return to the World Series in the seasons in which their uniforms boldly displayed their championship status, and perhaps this is why the practice has never returned. When one thinks of the quintessential baseball uniform, it is often adorned with a team or city name angled across the shirt front in script lettering. 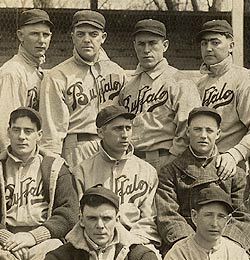 The first big league club to use this design was the 1914 Federal League Buffalo Blues (also known as the Buffeds). It was not until 1930 that the script lettering was reintroduced into big league baseball. In that year, the Detroit Tigers adopted the style that has since been embraced by nearly every major league club at some time during its history. The earliest known use of script lettering on any professional team uniform is 1902, when the style was used by both Oakland and San Francisco of the California League. Some baseball clubs are closely identified with their lettering style. The interlocking “NY” of the Yankees and the word “Cardinals” hanging on the familiar birds-on-a-bat graphic are examples of styles that have long been associated with baseball clubs. However, when these designs were first used, it wasn’t certain that they would last. Who knows what new designs of today will one day be looked upon as baseball classics? The following is a list of the first time that well-known lettering styles were used on the uniforms of a number of major league clubs. The Atlanta Braves (formerly Boston and Milwaukee Braves) first used the script-lettered “Braves” on a tomahawk in 1946. The Baltimore Orioles first used the script-lettered “Orioles” with a flourish below in 1954. The Boston Red Sox first used the fancy lettering style for “RED SOX” on its home jersey and “BOSTON” on its road jersey in 1936. The Brooklyn Dodgers first used “Dodgers” in its familiar script lettering with a flourish below in 1938. The Chicago Cubs first used the round “C” surrounding the letters “UBS” in 1909. The Chicago White Sox first used the Old English-styled “SOX” on the front of their jersey in 1949. The Cincinnati Reds first used the word “REDS” within a pointed “C” in 1911. The Cleveland Indians first used the script-lettered “Indians” with a flourish below in 1946. The Detroit Tigers first used an Old English “D” on their big league uniform in 1904. The New York Yankees first used the familiar interlocking “NY” logo on their cap and sleeve in 1909 and on the front of their jersey in 1912. The Oakland Athletics (formerly Philadelphia and Kansas City Athletics) first used the Old English “A” (currently seen on the club’s caps) in 1902, but at that time the letter was donned on the front of the club’s jersey. The Philadelphia Phillies first used the script-lettered “Phillies” with stars dotting the “i”s in 1944. The Pittsburgh Pirates first used “PIRATES” and “PITTSBURGH” in its familiar style of block lettering in 1948. The St. Louis Cardinals first used the word “Cardinals” with its initial “C” hanging on the birds-on-bat logo in 1922.